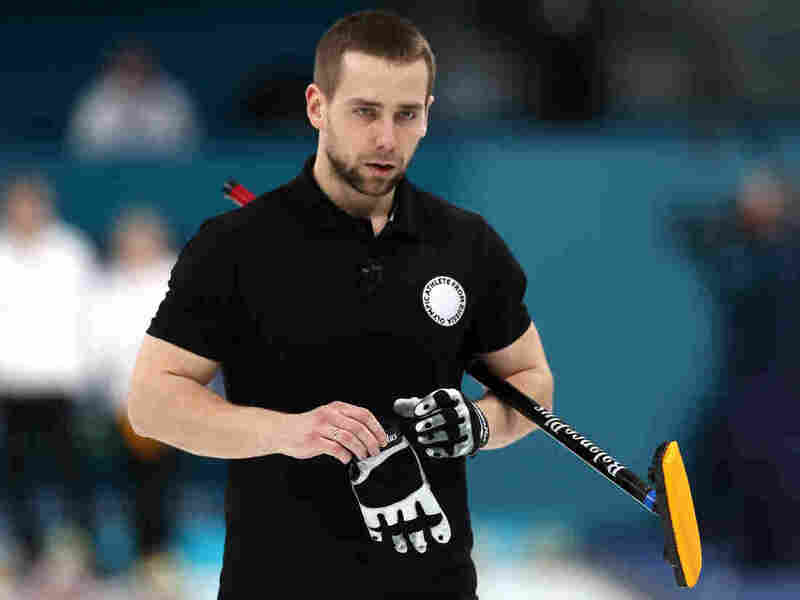 Russian Curler Stripped Of Olympic Bronze After He's Found Guilty Of Doping : The Torch Aleksandr Krushelnitckii and his wife have given up their mixed doubles medal after he tested positive for a banned drug. It's unwelcome news for a Russian delegation already embroiled in scandal. Aleksandr Krushelnitckii, seen during the bronze medal game against Norway last week. The Olympian from Russia won that mixed doubles bronze — but had the medal stripped Thursday for testing positive for a banned substance. Aleksandr Krushelnitckii has officially lost his Olympic bronze. The Russian curler, who tested positive for a banned substance known as meldonium, admitted to violating anti-doping rules in Pyeongchang. And on Thursday, the Court of Arbitration for Sport, the highest court in international athletics, handed down its punishment: Krushelnitckii has been disqualified, and he and his teammate and wife, Anastasia Bryzgalova — who did not test positive — have lost the medal they won in mixed doubles competition. That bronze is now expected to go to the Norwegian team that finished fourth. The ruling comes as a blow to a Russian delegation that had already been competing beneath the heavy cloud of scandal. Late last year, the International Olympic Committee banned the Russian Olympic Committee and dozens of the country's athletes from these Winter Games due to "a widespread culture of doping in Russia" — and specifically, an alleged state-sponsored system of cheating in evidence at the 2014 Games in Sochi. Those athletes who were allowed to compete in Pyeongchang, such as Krushelnitckii, had to leave their Russian colors at home and compete beneath a neutral Olympic flag. They also had to pass particularly rigorous testing. It is partly for this reason some of Krushelnitckii's fellow curlers expressed surprise at the failed test for meldonium, a drug believed to improve athletic performance by boosting blood flow. 'You'd never know if it was on purpose or by accident," U.S. curling captain John Shuster said earlier this week, according to The Associated Press, "but obviously that's been banned for a year and a half and I can't imagine that that was something that happened on purpose." The president of Russia's curling federation, Dmitry Svishchev, has claimed it is possible Krushelnitckii's food or drink was spiked. In a statement Thursday, Svishchev asserted that Krushelnitckii's decision to waive his right to a CAS hearing was "by no means an admission of guilt" — and he vowed to keep fighting on Krushelnitckii's behalf. "Unfortunately we have to part with the Olympic bronze medal," he said, according to a Reuters translation. "I really hope and believe that this is temporary."